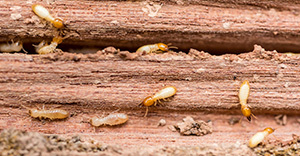 Offering a free termite inspection to residents of Escondido, California, is Kilter Termite and Pest Control’s way of helping homeowners avoid any delays in dealing with termites. Termite infestations can spread quickly and result in serious, costly damage to walls, floor, windows, doors, and many other areas of the home. Our inspections are not only free, but also come with no obligation or high-pressure sales tactics. If you do decide to use our services, you’ll benefit from out advanced treatment system call KILGUARD. This treatment is unlike fumigation, which fills homes with toxic chemicals, forcing families to vacate for days at a time. Rather, KILGUARD precisely targets infestation sites and does not involve fumes or strong odors. Not only can you remain home while treatment takes place, but you also won’t even have to bag up food or medications. Best of all, our termite treatment system is proven effective and backed with an outstanding two-year warranty. Whether you suspect your home might have termites or would simply like a team of trusted professionals to accurately assess your infestation, contact Kilter Termite and Pest Control for a free termite inspection today. When you do, also ask about our wood replacement services, which can help restore areas of your home in Escondido, CA, that have been damaged by termites.